Good evening, all! I was relaxing on the deck after work today, and I thought that I would share some pictures of my little garden with y ou. As usual, I’m mostly growing herbs, but I’m also trying tomatoes and hot peppers this year – in Topsy Turvy planters! I planted a tomato plant in the Topsy Turvy, and another in a regular container. 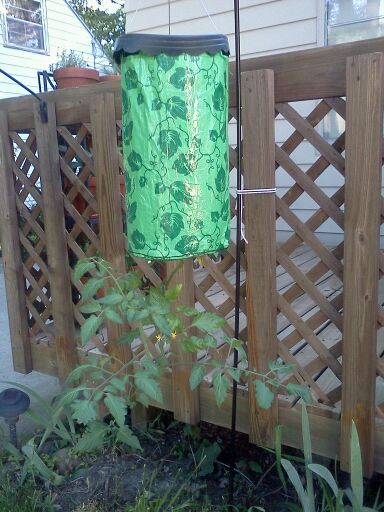 Funny thing -My Topsy Turvy tomato already has flowers on it, but not the container tomatos! So it’s a bit of an experiment, but so far the Topsy Turvy is winning :)I also have a lovely grouping of container plants on the patio – some cute little red flowers (I forget the name), my Bay tree (who is very happy to be outside) and a couple of Spiralis plants. The Spiralis plants are my favorites, just because they’re all boingy and fun. I’ve attached some photos for your enjoyment! I’ll do a seperate post to talk about my CSA this year, just so this one doesn’t get too long. The Spiralis plants are in the terracotta pots – very cool looking plants! 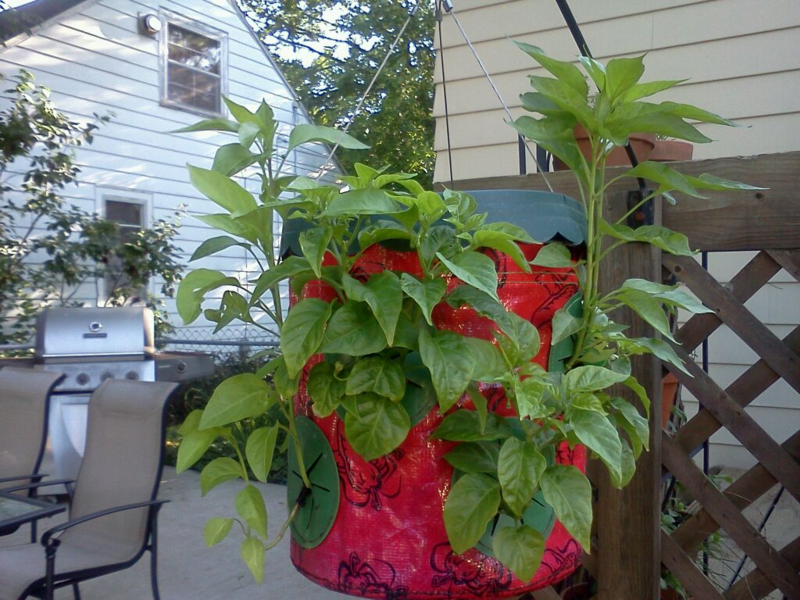 My Topsy Turvy pepper plant – jalepenos, habenaros and thai chillis! 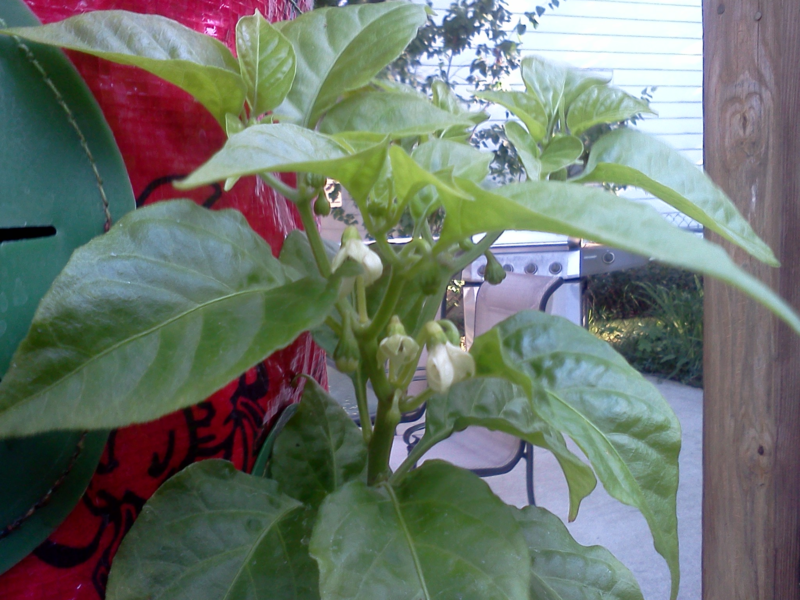 Flowers on the pepper plant! And my herb “garden”! 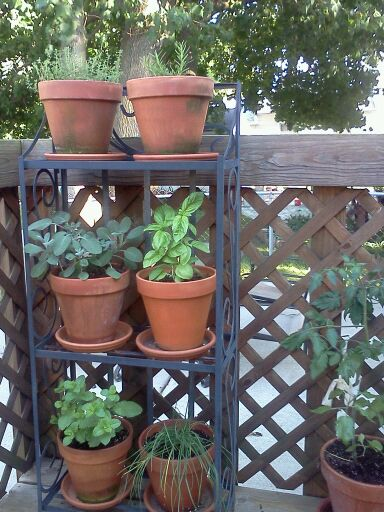 Thyme, Rosemary, Basil, Sage, Garlic Chives and Mint. 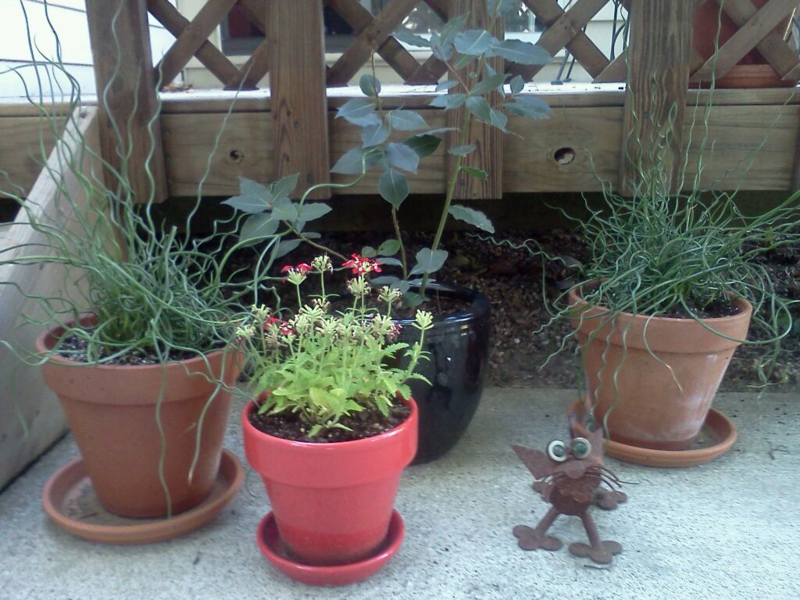 This entry was posted in General and tagged container garden, herbs, Topsy Turvy on June 4, 2012 by Melissa. Keep us informed on the topsy turvy it seems like a cool concept to me. As you most likely noticed we do peppers mainly cubanelle, some jalapenos, tomatoes, basil, and parsley. The cubanelles do very well in a container. Melissa, everything looks like it is really coming along! I can’t wait to see what recipes your peppers will inspire. I know you like some heat! I love the look of the all of the herbs in their own containers! So pretty, and everything you have planted so far looks really healthy! I, like Bethy, will want to know what you are cooking with the little hot peppers. Keep us informed, and we do love photos! Melissa, it all looks s organized, I’m sure Tom will be super impressed…heck I am! It looks very cool! That’s quite a bounty! Since joining Matt’s CSA we’ve switched almost entirely to flowers in our yard. I think the only exception at the moment is red and green basil, so we’re counting on the market for everything. Looking forward to updates on your garden all summer.